The Sandy River Delta is a unique among National Forest trail sites for trail riding. Bounded by the Sandy River and its Eastern distributary, the Columbia River, and I-84, the Delta offers several hours of riding and exploring on flat and wide trails. It is particularly suitable for winter and spring riding when mountain trails are snowbound. Weekends at the Delta can be tremendously busy even in less than ideal weather. Although designated trailer parking exists we have an ongoing problem with passenger vehicles using these spaces. It’s best to arrive early on weekends to get a spot, but if arriving and finding the spots filled, we encourage calling police non-emergency to request enforcement. The Delta is extremely popular for dog walking as well as for hunting, fishing, and birdwatching. Many of the dog walkers at the delta may be unaccustomed to horses so be aware, prepared, and communicative. When encountering dogs, alert the dog’s owners and stop your horses to allow the dogs to be leashed and collected. Be ready to offer advice for behavior around horses. 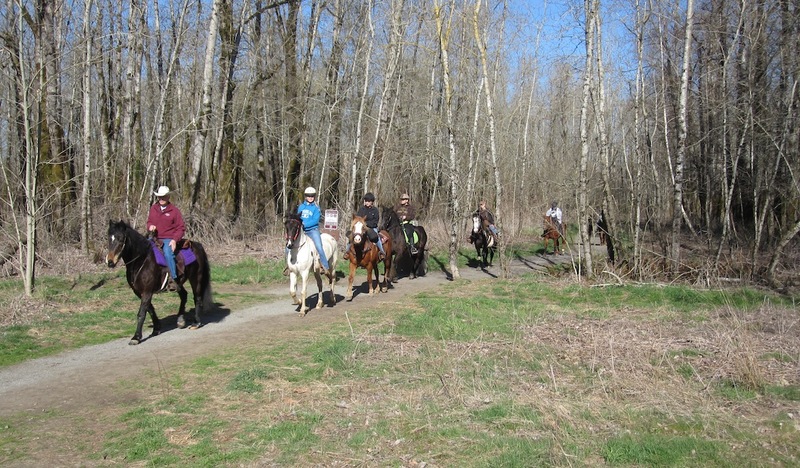 Most dog walkers are aware horses at the Delta, but education is still often necessary. The Forest Service purchased Sundial Island and Thousand Acres Ranch in 1991. The area (colloquially known as 1000 Acres) had already been an “under-the-radar” venue for hunting, fishing, equestrians, hikers, and dog walkers. The Forest Service acquisition facilitated the public access, and awareness of the area grew. 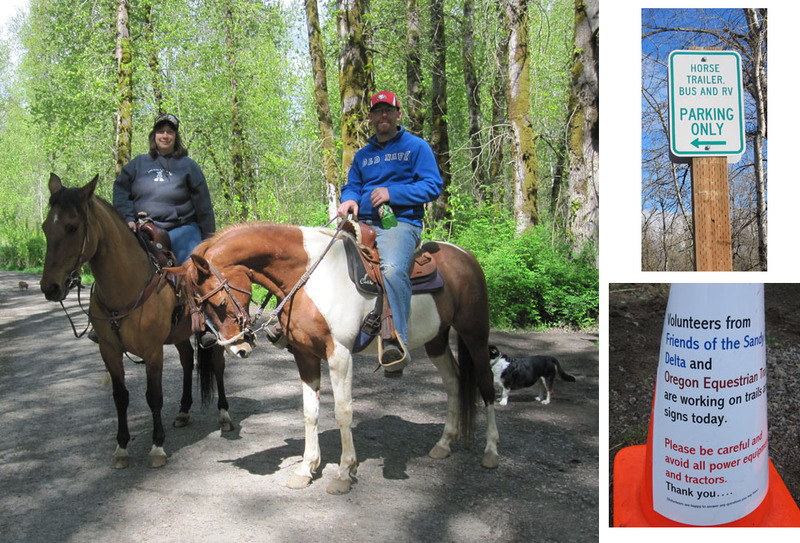 Oregon Equestrian Trails (OET) began volunteer activities in the 90’s clearing briars from what had been mostly cattle trails. Gates allowing passage through the grazing area were installed by the volunteers as well. In 2005 the Forest Service introduced the Confluence Project (Maya Lin’s installations commemorating Lewis and Clark) and the “development” of the Delta through a series of public meetings. It was during these events that OET, and a group of newer and equally dedicated dog enthusiasts, joined as what is now Friends of the Sandy River Delta. Both groups realized the best plan would be to work together as a multiple-user group to keep the delta clean, develop and maintain trails, and to help educate users for the benefit of the recreation site. OET is still integrally involved as part of the FSRD and with the Forest Service (CRGNSA) in maintaining trails, addressing user issues and interactions, education, and site cleanup.